The Sinn Féin president hit out at the UK Northern Ireland secretary, who this week rejected the possibility for a “border poll” on the region’s status. A REFERENDUM ON the position of Northern Ireland as part of the UK is inevitable, Sinn Féin president Gerry Adams has said. Adams today launched a stinging attack on the UK Secretary of State for Northern Ireland Owen Paterson, who this week dismissed the possibility of holding a ‘border poll’ on the status of the region. The political landscape in the North has been transformed in recent years and there is growing support for a united Ireland. A border poll is inevitable. Mr Patterson knows this. Earlier this week, Paterson confirmed in the UK House of Commons that he had no intention of calling a border poll. According to UTV, he cited the results of a Queen’s University survey that showed 82.6 per cent of people in the North want to remain in the UK. Speaking at a Sinn Féin conference in Derry, Gerry Adams today insisted that his vision of a united Ireland was one open to unionist views. He said it would come when “the people of our island have formed a cordial union of Catholic, Protestant and Dissenter”. Adams added that at present, unionists are “isolated” in Britain where they make up just two per cent of the population. “In a united Ireland unionists would make up 20 per cent of the population and be able to exercise real authority, power and influence,” he said. Email “Referendum on united Ireland 'inevitable' - Adams”. 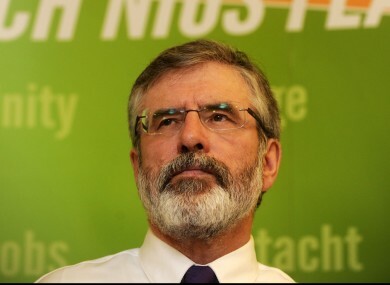 Feedback on “Referendum on united Ireland 'inevitable' - Adams”.